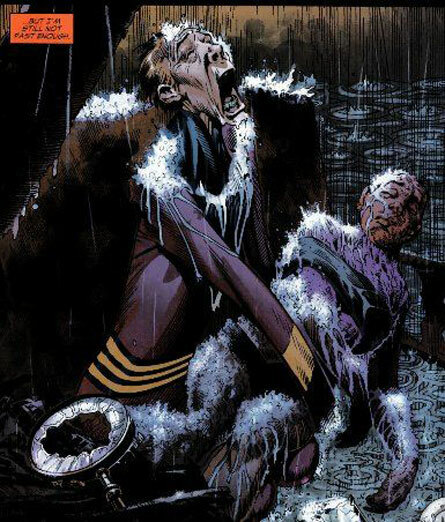 I decided to go back and read and review the epic Story Arc that made me jump on the DC Comics bandwagon and leave Marvel like “a girl left behind on her doorstep on prom night”. The epic story: “Identity Crisis”. Main Plot – The story is centered on the murder of Sue Dibny, the wife of the minor superhero, the Elongated Man. Whoever the killer is, he/she was able to bypass a triple-layered alien security system, conduct the murder, and left without a single trace or motive. Sue’s death sends a ripple of fear throughout the superhero community, as even the indestructible are terrorized by the threat presented to their more ordinary loved ones. As the puzzle pieces of the mystery slowly falls into place, a darker secret emerges from within the league that has the potential to obliterate the social cohesion of the group. Soon, it would become apparent that the heroes’ worst enemies are not the villains,but themselves. 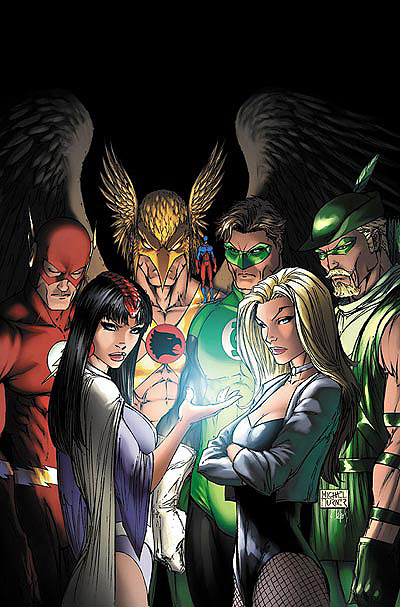 One of the major plot threads is the breakdown of relationships within the Justice League of America and is examined in the storyline “Crisis of Conscience” in JLA #115-119 (August–December 2005). 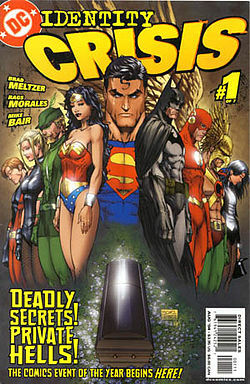 The mini-series is followed by the inter-company crossover “Infinite Crisis”. Identity Crisis is a seven-issue comic book limited series published by DC Comics from June to December in 2004. 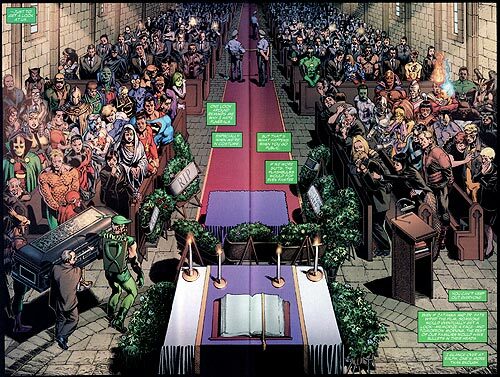 It was created by writer Brad Meltzer and the artistic team of penciler Rags Morales and inker Michael Bair. Identity Crisis takes a look at our heroes who wear a mask, and who they are without it. I actually cried at a couple of parts, and when the wife of Elongated Man dies, it just breaks your heart. I didn’t even know who he was, but just within a couple of pages, your heart goes out for him and you start to really wish the impossible (since you already know the outcome). And that wasn’t even the end of my tears. There are more heartbreaking moments in the comics and when you find out who actually did it (I was guessing until the very end) you’re just as surprised as the Justice League. What’s great is that so many superheroes make appearances (not just from the Justice League, but from other superhero groups and even a couple villain groups) and it isn’t confusing at all. I loved the interactions between the superheroes because you could really tell that they had been in each other’s shoes before and how close some of those bonds are, even if they don’t know each other on a personal level. Story is amazing I would suggest this even to people who don’t really read comics. It is definitely in my top 5 graphic novels of all time and beautifully drawn by Rags Morales. This is not a “kiddie” story as it is very adult. Only drawback is if you are not familiar with the DC universe you made need to have wikipedia handy as Metzler breaks out alot of DC characters and even two generations of the same super. 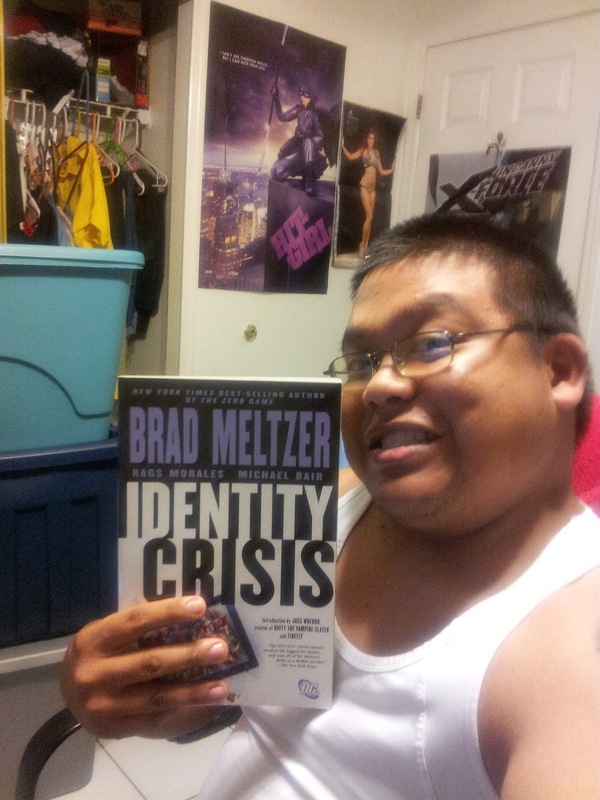 Identity Crisis is more than your average super hero story. It gets deep into there personal lives and into the back stories of the heros and villians alike. The action is top notch with Slade/Deathstroke doing serious damage and the story is emotional and gripping. Very impressed with the quality of the art work and the depth of the story. “Identity Crisis” is a dark and emotional graphic novella that illustrates the fragility of the human mind. It is well-written, sophistically organized, and artistically immaculate. Meltzer breaks away from the cookie-cutter comic book mold and creates a story that is deeply imaginative, yet realistic. His “Identity Crisis” is a masterpiece that has become a fundamental strand in the contemporary fabrics of the DC Universe.